Food and the gut go on show, Angolan ‘sea monsters’ resurface and Alexander von Humboldt pops into focus. Nicola Jones reports. Alexander von Humboldt Museum Ludwig, Cologne, Germany. Until 27 January. Prussian polymath and explorer Alexander von Humboldt’s 250th birthday rolls around this September. The ‘father of environmentalism’ is credited with envisioning geology, ecology and humanity as part of an interconnected web. Less well known is his role in early photography. In 1839, Humboldt was among the first established scientists to embrace the daguerreotype, invented by Louis-Jacques-Mandé Daguerre and Nicéphore Niépce. 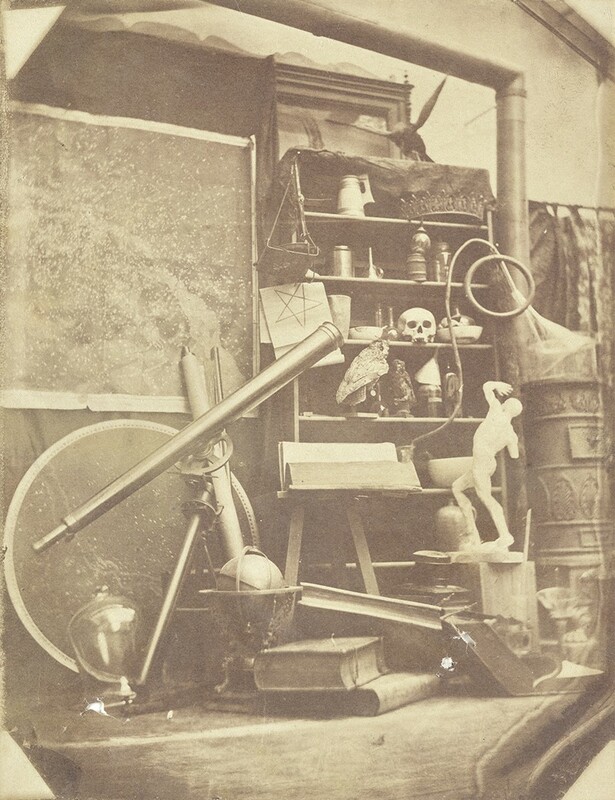 On show will be photo albums from Humboldt’s collection — one a present from British photographic innovator William Henry Fox Talbot; another with some of the first-known photographs of Mexico, Venezuela and Cuba. Sea Monsters Unearthed: Life in Angola’s Ancient Seas National Museum of Natural History, Washington DC. Until 2020. Some 130 million years ago, the supercontinent Gondwana was being ripped apart, forming Africa and South America. The South Atlantic Ocean emerged between them. Today, Angola is a hotspot for tracking the sea’s biological record: it is the only African nation with known outcrops of fossil-bearing rocks from this period. In 2005, after decades of war, a major geological expedition reached the region. Projecto PaleoAngola unearthed a new dinosaur species, the long-necked sauropod Angolatitan adamastor; a host of sea turtles; and giant marine reptilian plesiosaurs and mosasaurs. 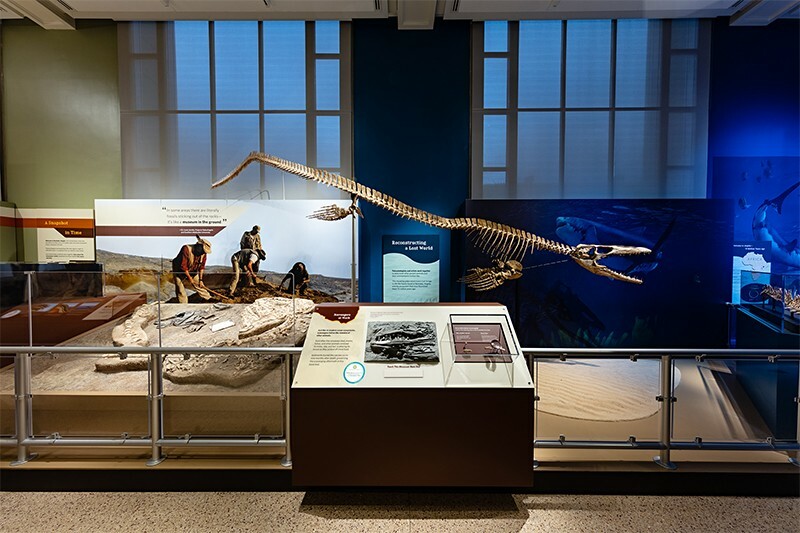 Full-scale reconstructions and fossils will be on display at the US National Museum of Natural History. 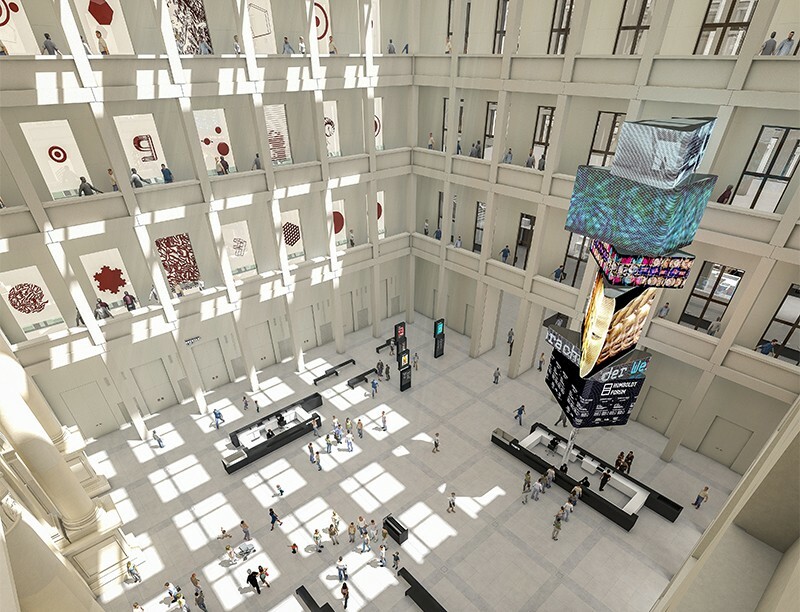 Meanwhile, the museum’s David H. Koch Hall of Fossils will open on 8 June with Deep Time, featuring 700 specimens and the return of a Tyrannosaurus rex fossil. 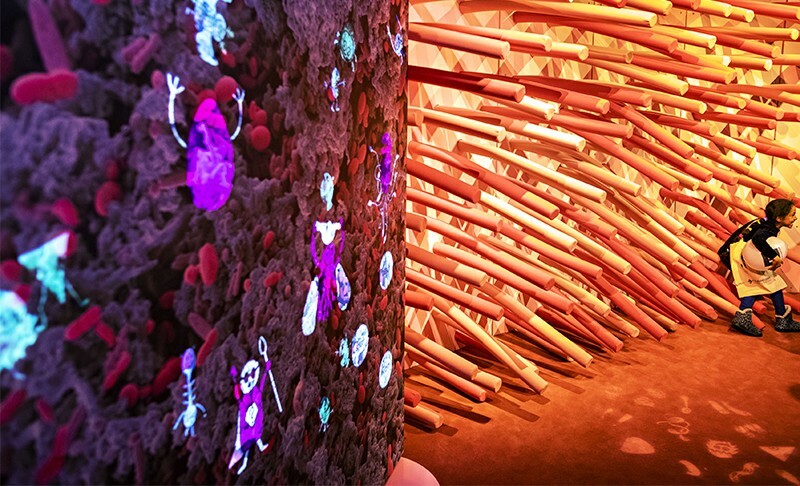 Microbiota: The Inside Story of Our Body’s Most Underrated Organ Cité des Sciences et de l’Industrie, Paris. Until July. In 2014, microbiology student Giulia Enders penned a book on the digestive system, Gut (in her native German, Darm mit Charme, or ‘Charming Bowels’). The bestseller inspired this exhibition, produced with the French National Institute for Agricultural Research among other bodies, and with Enders’s input. The show (pictured below) echoes the book’s lighthearted approach to shadowy topics such as the workings of sphincters inner and outer, and the benefits of squatting for defecation. By the Light of the Silvery Moon National Gallery of Art, Washington DC. 28 April – 14 October. On 20 July 1969, Apollo 11 delivered astronauts to the Moon for the first time. To mark the 50th anniversary, 50 lunar portraits spanning more than a century feature here. 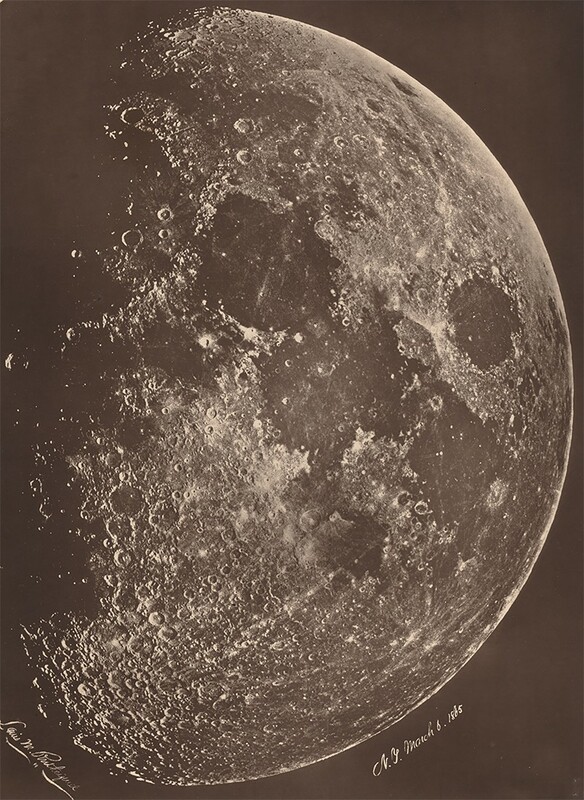 On show will be a stereograph of the Moon, taken by English astronomer Warren de la Rue in the 1850s; alongside will be close-up stereographs of the lunar surface by Neil Armstrong and Buzz Aldrin, and iconic photos from early uncrewed orbiters. Also on view will be French astronomer Charles Le Morvan’s 1914 photogravures (richly detailed etched copper plates produced from photographic negatives): an attempt to systematically map the visible lunar surface. Food Victoria and Albert Museum, London. 18 May – 17 November. How we gather, hunt, grow and process food has changed dramatically, from the invention of agriculture some 10,000 years ago to the creation of weight-loss supplements. This exhibition looks at the science and politics of what we eat, from urban farming to synthetic, lab-grown meat fibres and algae-coated spheres of water. New commissions and pieces from the museum’s collection will examine how we can make food more sustainable, tasty and ethically just. Natalia Goncharova Tate Modern, London. 6 June – 8 September. In the early twentieth century, Russian avant-garde artist Natalia Goncharova and her partner Mikhail Larionov developed rayonism — an artistic style drawing inspiration from contemporary scientific breakthroughs. The discoveries of X-rays and radioactivity prompted the artists to represent material reality beyond the reach of the human eye, through fractured shapes and dynamic lines representing light. Descriptions of a mystical ‘fourth dimension’ by Russian mathematician Peter Ouspensky in the early 1900s resonate in their work, too. Also on show will be Goncharova’s futurist body art, and set and clothing designs. The luminary of art and science in the Italian Renaissance, Leonardo da Vinci, died 500 years ago this May. The anniversary will be marked across Europe. Water as Microscope of Nature: Leonardo da Vinci’s Codex Leicester Uffizi Gallery, Florence, Italy. Until 20 January. Here’s a chance to gaze at some of Leonardo’s spellbinding scientific explorations, not far from his Tuscan birthplace. 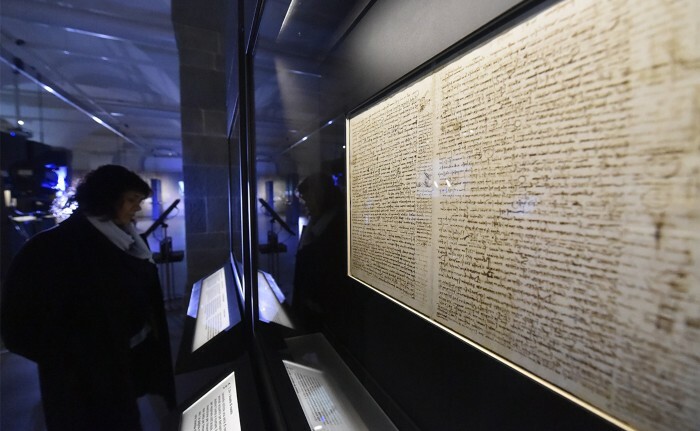 The Codex Leicester, on loan from Microsoft founder Bill Gates, is a 72-page, mirror-written notebook. It features beautiful images of the movement and erosive capacity of water, an explanation of why fossils are found on mountains, speculation that the Moon’s shine is caused by surface water, and more. The codex will also be on display, with two others, in Mind in Motion at the British Library in London, from 7 June to 8 September. Leonardo da Vinci: A Life in Drawing Across Britain. 1 February – 6 May. One hundred and forty-four drawings capturing the range of Leonardo’s interests, from painting and music to engineering and botany, will feature across a dozen shows in UK cities from Belfast to Sheffield. Then, from 24 May to 13 October, they will be part of an exhibition featuring 200 drawings (an example pictured) at the Queen’s Gallery in London (including two apparently blank pages that under ultraviolet light reveal faded studies of hands). From 22 November 2019 to 15 March 2020, 80 of these will grace the Queen’s Gallery in Edinburgh. 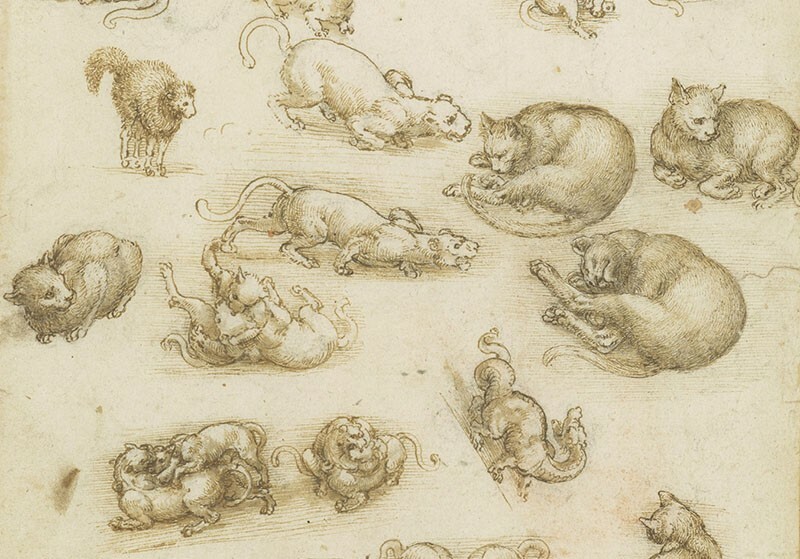 Leonardo da Vinci and Perpetual Motion: Visualizing Impossible Machines Peltz Gallery, Birkbeck University of London. 6 February – 12 March. Featured will be digital reconstructions and 3D printouts of ‘perpetual motion’ machines designed by Leonardo. Models of perpetual wheels that appear in two of his famous notebooks (the Codex Forster II and the Codex Atlanticus) are included. Milan and Leonardo Milan, Italy. 2 May onwards. This nine-month extravaganza in the artist-scientist’s adopted city kicks off with the reopening of the Sala delle Asse in Sforza Castle on 2 May. The nature-inspired murals that Leonardo painted for the Duke of Milan in this room have been under restoration for several years. A virtual tour of what Milan looked like in Leonardo’s time is also in the offing. Leonardo da Vinci The Louvre, Paris. 24 October 2019 – 24 February 2020. At this blockbuster show, drawings (some from Britain’s Royal Collection) will be shown along with many of the 17 paintings now attributed to Leonardo. They join his five notable paintings held by the Louvre, including the Mona Lisa. Total Solar Eclipse La Silla Observatory, Chile. 2 July, 16:39. This year’s total solar eclipse will be visible only from South America and the Southern Pacific Ocean — a fitting moment for La Silla Observatory as it celebrates its first half-century. La Silla marks this portentous alignment with talks, tours and workshops for eclipse-chasers. The year is a big one for astronomy and physics in other ways, too. The International Astronomical Union turns 100, and May sees another centenary: that of astronomer Arthur Eddington’s momentous use of a total solar eclipse to secure the first experimental proof of Albert Einstein’s general theory of relativity. Graffiti as Devotion along the Nile Kelsey Museum of Archaeology, Ann Arbor, Michigan. 23 August 2019 – 5 January 2020. In Kush, an ancient kingdom in what is now Sudan, many pilgrims left their mark on temples and pyramids starting around 300 bc. Archaeologists examining the graffiti have found inscriptions in ancient Egyptian and Greek describing everything from festivals to diplomatic missions. This show explores hundreds of pieces of pictorial graffiti — including horses, a man with a bow and a giraffe — discovered in a rock-cut temple by Kelsey Museum archaeologists in El Kurru, northern Sudan. Drama, film and television programmes in 2019 will grapple with Ebola, space travel, the disturbing roots of gynaecology and more. Behind the Sheet Ensemble Studio Theatre, New York City. 9 January – 3 February. Controversial nineteenth-century surgeon Marion Sims developed an operation for vesicovaginal fistula, a birth complication that leaves women incontinent. Egregiously, he experimented without anaesthesia on enslaved women of colour in Alabama. They had no power to refuse or consent. 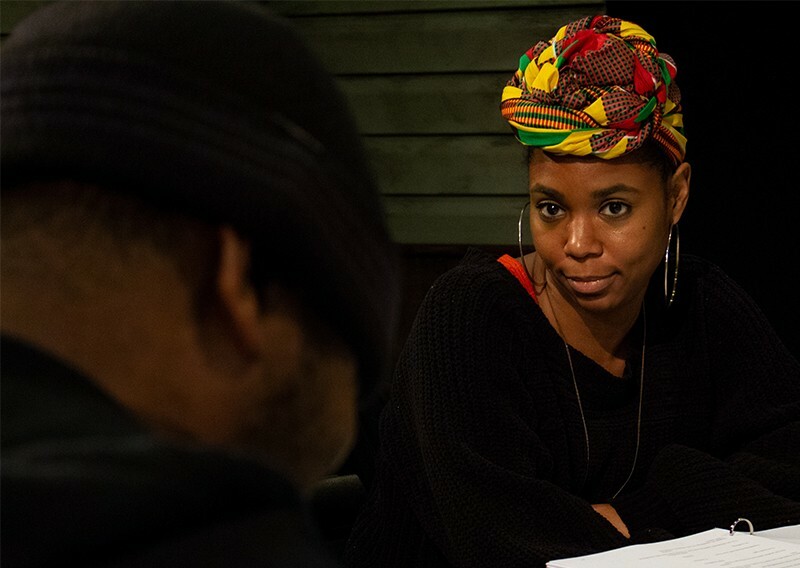 Playwright Charly Evon Simpson tackles the story in a drama exploring the experiences of three of them — Anarcha, Lucy and Betsey (pictured, Naomi Lorrain, who plays Philomena, the doctor’s enslaved assistant). Ad Astra Twenty years after his father disappeared on a mission to Neptune, a US Army Corps engineer (Brad Pitt) sets out to discover what happened, in this blockbuster film directed by James Gray. US release: 24 May. The Hot Zone In 1989, the US Army and Centers for Disease Control and Prevention spun into action when an Ebola outbreak killed dozens of monkeys in a primate facility just outside Washington DC. The gripping tale of the response, as told in the 1995 book of the same name by Richard Preston, will play out in a television mini-series on National Geographic this year. Juliana Margulies plays real-life virologist Nancy Jaax, who at the time was chief of the pathology division at the US Army Medical Research Institute of Infectious Diseases in Frederick, Maryland. A major twist awaits. Gemini Man Director Ang Lee presents a sci-fi action-thriller featuring Will Smith as an ageing assassin who must fight a younger clone of himself. US release: 4 October. The Future and Arts Mori Art Museum, Tokyo. 19 November 2019 – 29 March 2020. Technology is intruding ever further into our everyday lives, from the artificial intelligence that guides smartphone voice activation to blockchains used to ‘mine’ cryptocurrency. This exhibition asks artists to reflect on what life might be like a few decades in the future — for better or for worse. Medicine Galleries Science Museum, London. Opening in 2019. At more than 3,000 square metres, these galleries will offer a permanent space for contemplation of the human body and health in London’s Science Museum. Some 2,500 artefacts from its archives, and those of the Wellcome Collection across town, will illuminate 500 years of medical history. A 3.5-metre sculpture will greet visitors — the work of Marc Quinn (best known for Self, a series of casts of his own head in frozen blood). Called Self-Conscious Gene, it portrays the late Canadian artist Rick Genest, who covered his body with tattoos of his skeleton and organs. The Humboldt Forum Berlin Palace. Opening end of 2019. Berlin’s massive, €595-million (US$674‑million) museum and event space is set to rival London’s British Museum. This ‘palace for all’ — named after naturalist Alexander von Humboldt and his diplomat brother Wilhelm — will house old and new collections, including those of the Ethnological Museum of Berlin and the Museum of Asian Art. The Humboldt Laboratory will be dedicated to showcasing research from the city’s Humboldt University.